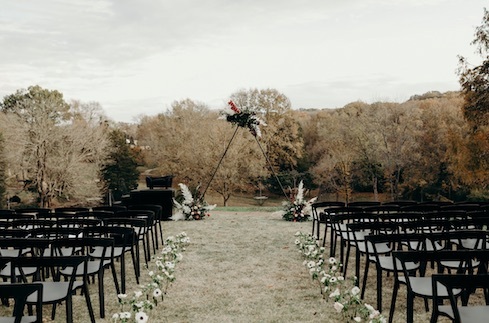 Idyllically located just eight miles west of downtown Nashville, Cheekwood is the area’s premier wedding destination. 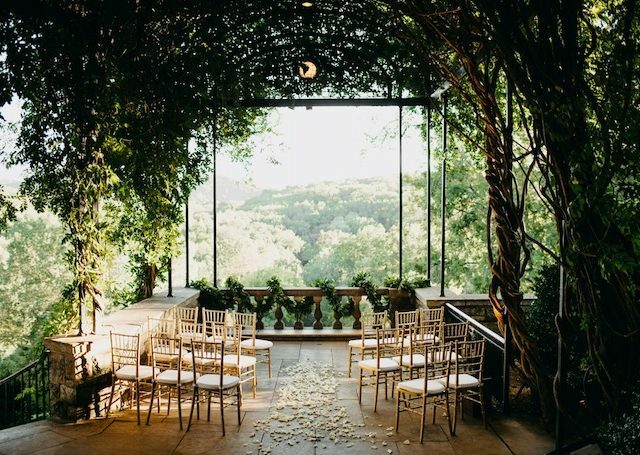 Cheekwood offers unique indoor and outdoor spaces suited for any couple, from intimate garden ceremonies to lavish receptions. The talented special events team at Cheekwood provides services to an average of 75 brides per year. And with a busy wedding season just ahead, we asked Special Events Manager Jenny Morris to share with us this year’s most defining style trends. More and more couples elect to source local artists to produce custom artwork for their event. This can be found in multiple forms. 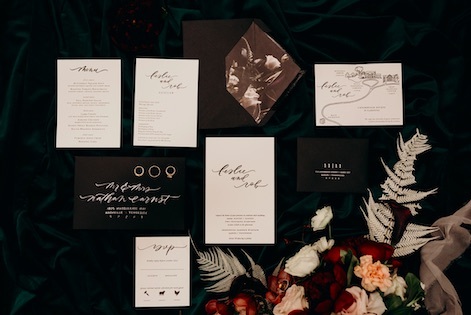 One way to incorporate illustrative artwork in form of stationary items such as save-the-dates and invitations. In this digital age, guests and couples find hand illustrations to be a refreshing way to create a memorable invite. Another trend becoming popular is hosting an artist on site to capture the moments on canvas in real time. Guests enjoy watching the artist work during the reception and the bride and groom take away a keep-sake beyond photographs. Looking for a way to cut some of the pressure? Some couples are choosing smaller ceremonies and/or receptions. We have seen a rise in elopements and small ceremonies over the last couple of years that has now transpired into smaller receptions as well. Smaller gatherings allow the couple to really focus on themselves and their most intimate circle of people in their lives. All guests get to spend adequate time with the couple in the celebration that creates deeper memories for all involved in the celebration. Also to remember – every head at your wedding has a price attached. By lowering the guest count, you can elevate the budget to spend on the extra details you have always dreamed. Velvet made a giant comeback in 2018 and will be in full force for 2019 weddings. This luxurious fabric makes a large statement as a foundation to any table space. Don’t just look for this textile on the table. Velvet is can be found in various forms to soft seating and seat cushions to ribbon details around florals. Look for specialty linen companies to provide the largest variety of color palettes for any season. Copper is a great versatile metal. Shiny and polished, copper suggests a glamorous and elegant feel. A matte finish copper provides a rustic or vintage element to the occasion. 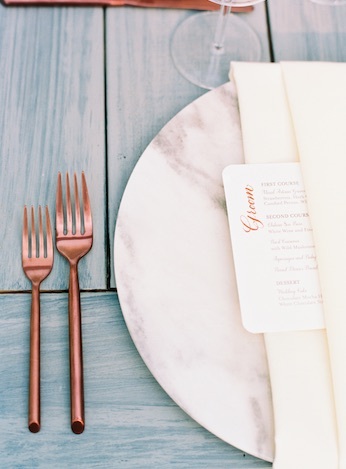 Copper is showing up in various form from flatware and floral vases to arches for ceremonial décor. 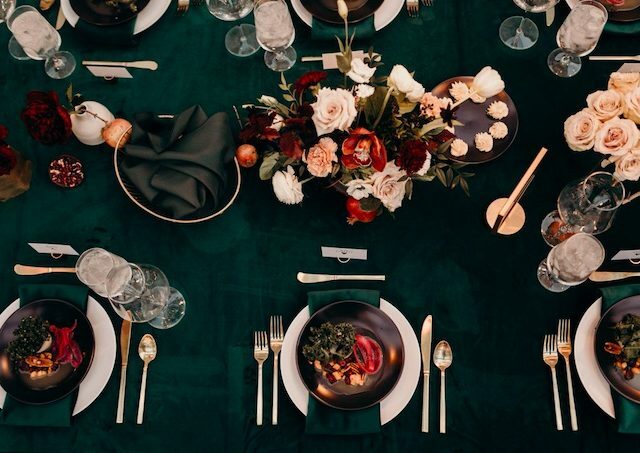 For an unexpected element for your table space, consider the copper route. Added bonus – it pairs nicely with popular mule cocktails! An alternative to the floral-filled arches that center the bride and groom for ceremonies, consider adding an industrial element such as shapes! We are spotting more and more metal or branch structures with an edited floral arrangement added for a more minimalistic style (which also lessens cost). These structures can be found in ceremony arches, cake decor or other decorative elements around your reception area.